Catherine look OK, nor any special but nor bad either. Victoria seems to love frills, well I do not. That dress would be rather nice without those frills. Silvia has not the best colors to be becoming to her. Bizarre that in the first 3 photos, everyone but Victoria hold their hands hands in front of them. 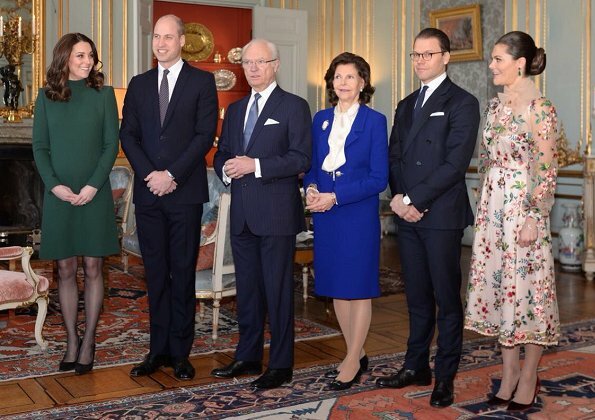 And in the 4th one, she looks like she holds a baby bump too, like the Duchess.Her dress? A big no from me, it should make her look young and fresh, instead, she looks matronly. I agree that Victoria´s dress makes her look matronly. It really needed to be shorter to look younger and fresher despite the matronly design. And that weird bow at her neck needs to go asap. Kate´s look is much more streamlined and easy on the eyes. Good silhouette and good colour. The dress could use a brooch or necklace or some interest (decorative seaming, little pocket or contrasting element) for the eye to rest on. Everyone looks uncomfortable. 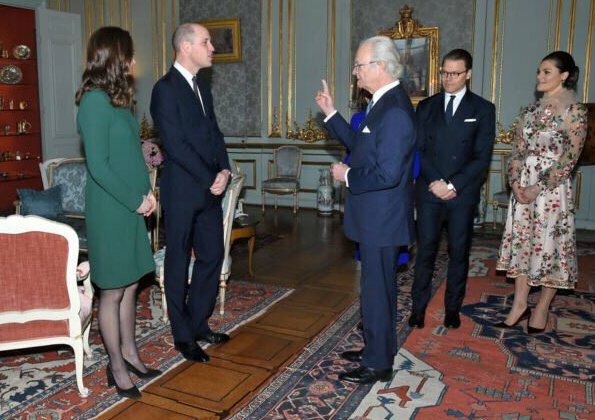 Where were the Swedish royals for the fun earlier? I understand it's scheduled and hope these pictures capture the formal introduction and that all goes well! Catherine looks lovely. Simple and elegant. Victoria looks a bit matronly in this fussy dress, apart from clashing with all the decor! Why does Silvia wear such boring day clothes? She could look so much nicer. Victorias dress is pretty but not fit for the occasion. It is too much and better fit for a summer lunch. Exactly. It looks silly in mid-winter and with the black shoes. What an odd choice. The queen needs to go find something new. She does love that blue suit. I hope everything is ok with kate's pregnancy. I know she is slim naturally but for someone that is about 7 months pregnant, you can only notice it when she is from the side and with tight clothes. 😕😕 She looked much bigger in her previous pregnancies. DoC simple dress in 'british racing green; CPV, well, in a long version it could be a nice evening gown. QS, one of her signature ensembles. Royal blue is a good colour for her. A pity CP Victoria is more elegantly dressed than her guest. Not polite. Victoria looks like a christmas tree! La princesse Victoria attendrait-elle un heureux événement? La façon dont elle se tient et la tenue qu'elle porte me font poser cette question. Me too,but I do not think so in view of other photos ! For me Victoria is the winner here. Risky choice but I like it. Catherine also looks nice but she is a safe player for a long time. At the begining when she got engaged to William and after their wedding she took some risks with the choices of her outfits but nowadays her outfits aren't interesting for me anymore. I like when royal ladies are not following fashion trends but they are dictating them. That's what a style or fashion icon means to me. Except that she is not a fashion icon, but the future queen of England. Yes, but everybody calls her style icon. At least in my country all the fashion blogs, journalists refer to Catherine as the one and only style icon of our century. I think Victoria looks great, neck frill is wonderful too. Another blah dress for Catherine. I like Victoria's because it is the most colorful. Victoria is only 4 years older than Kate but looks so much older. She hasn't had the best choices lately (that green jacket!) but this one doesn't do a thing for her, and her ugly bun. She could look so much better than that! Victorias dress is awful. Kate have a conservative, classic dress that looks perfect with her coat. So she clearly wins the dress game. Victoria looks terrible, honestly! 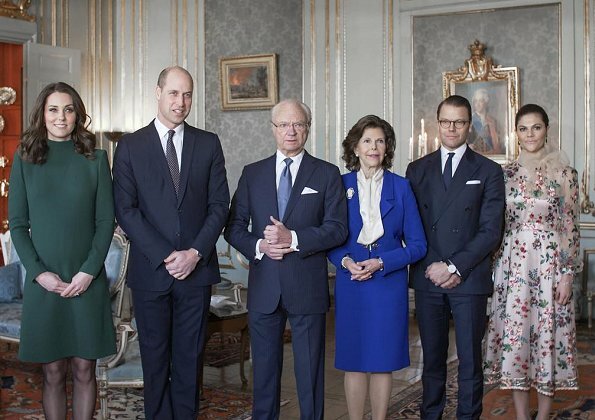 Not sure who did the worst job, the stylist or Ida Sjöstedt. 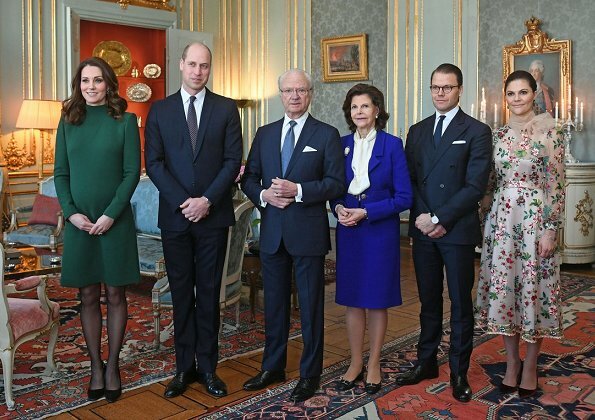 Swedish fashion designers really should be avoided, and the princesses allowed to make stylish choices and not necessarily national ones.